This therapeutic health massage is designed to loosen tight muscles and smooth knots using deep firm strokes. A firm pressure targets your areas of need and promotes relaxation and relief from pain. Your circulation will be improved and you will leave refreshed. Our deep tissue massage targets specific areas for deeper relief using slow stroke techniques. This massage will loosen your muscles if you have an active lifestyle or are highly-stressed. This will turn you from exhausted to energized. An effective massage in the traditional European style. This relaxing yet firm massage will ease your muscle tension while allowing you to fully relax. Slow smooth strokes are used to remove knots and improve circulation. This massage combines some deeper work to target your specific areas of need. Your sore muscles will find the relief they deserve. This relaxing massage is a form of Swedish massage with deep strokes that stimulate your circulatory system with the added benefit of natural essential oils. 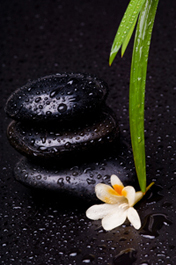 We concentrate on your specific area of need and will calm your mind and soothe your mood. Your pain will be alleviated and you will feel refreshed. A relaxing massage that uses heated smooth, flat stones which are placed on key points on the body. The combination of pressure and warmth from the stones promotes deep muscle and tissue relaxation and alleviates stress while releasing toxins, improving circulation and calming the mind. thumbs, elbows and knees. Shiatsu helps to stimulate the circulatory and lymphatic systems promoting increased energy and reduced pain.